Bookcase premium WordPress theme is a uniquely interactive portfolio template perfect for freelancers, web designers, photographers, and videographers alike. 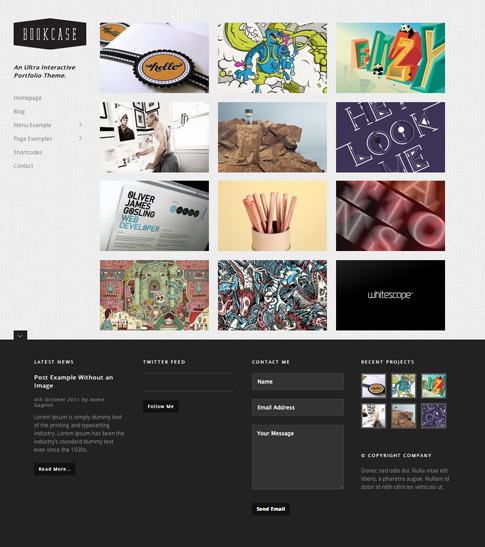 Bookcase premium theme’s interactive user interface delightfully enhances your most loved portfolio pieces. We love the minimal layout of this amazing online showcase theme and we think you will, too. Check it out at the end of the post! Unique features slider — say goodbye to icon feature lists! Come back and check out the showcase as we find more sites from around the web using Bookcase.